Ian Campbell-Elliott has raised concerns about William the Care Home Dog. A meeting has been called to discuss a care home dog, after residents say they “miss him” since he went into semi-retirement at the end of last month. 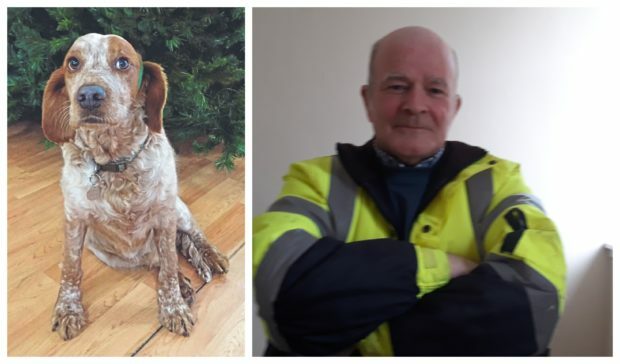 Concerns for William the Care Home Dog, who last year rescued a women from near death, will be aired next Wednesday night in Fort William, because residents and carers feel he has been taken away from Invernevis Care Home without consultation. William was rescued from his life as a street dog in Cyprus before he moved to Scotland, and was permanently rehomed with residents in Lochaber in 2016. The community raised more than £8,000 for a hip operation for the pooch, and have continued to make cash and food donations for the cocker spaniel ever since. 10-year-old William rose to hero status when he led his walker to an elderly woman who had fallen, out of sight of passers-by, in a patch of woodland – effectively saving her life. Earlier this month the Press and Journal reported that William had gone into semi- retirement after advice from a vet. William, it seemed, was being killed with kindness – with residents feeding him titbits of chocolate and other sweet treats. Former army dog handler Ian Campbell-Elliot, who has raised hundreds of pounds for William, said: “We miss him, we are all really worried about William, and the fact that he is not in the care home permanently anymore. We were never consulted on whether William should be taken away from the home overnight. “Lots of people raised money for William, and the community is disappointed that we can no longer see the dog when we want. In a statement from the care home last month, it was said William would live with the care home manager at night, and he would be in the home each day. A public meeting to discuss William will be held on Wednesday, March 27 at 6.30pm in Invernevis House.